Customized Politcial Emery boards are excellent campaign advertising. Especially attractive and effective to target women voters. Emery boards are very popular with women. We can help you design all your products for your campaign and offer not only years of experience but free quotes. 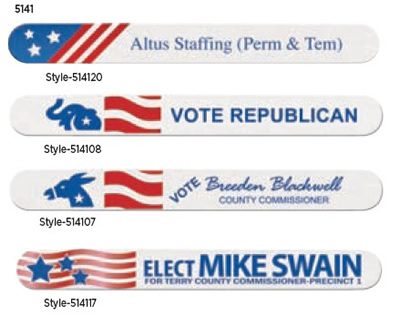 Many styles to choose from: Stars with Diagonal Stripes, Democrat Donkey,Republican Elephant or Stars on Wavy Stripes. Imprint area varies depending on political design with most imprint areas of 2-1/2" wide by 3/8" high. Print up to 3 lines of text. Shipping and handling is free (ground shipping within the USA)! An additional $50 non-refundable artwork charge must be paid before work can begin.